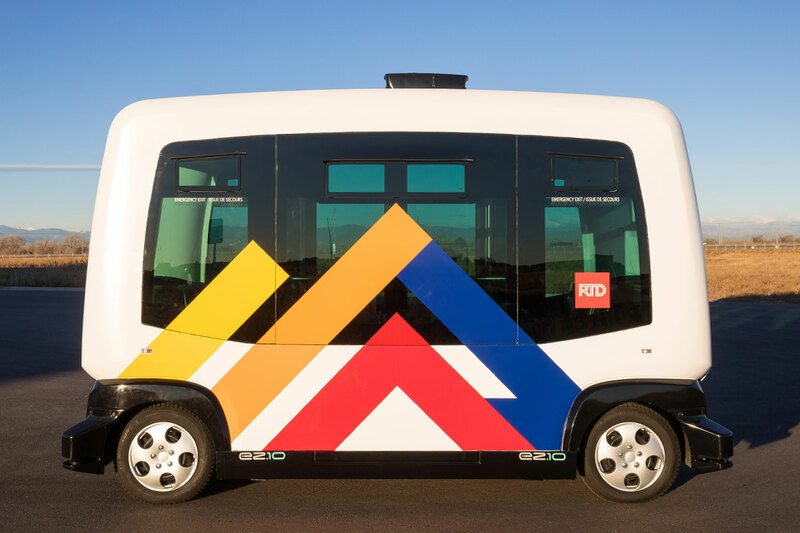 RTD's 61AV autonomous shuttle service will launch January 29. All photos: RTD. Starting next Tuesday, you will be able to hop off of the Regional Transportation District’s A-Line train and into an automated electric shuttle. The vehicle, which is part of a pilot project, will not be useful to many people as it circulates around a virtually empty tract of land near Denver International Airport. But the new mobility option could one day get people out of cars and onto buses and trains by connecting transit stops to destinations too far to walk. “The 61AV project … will introduce an autonomous vehicle on a public roadway through a pilot program as a possible first-last mile solution for transit riders,” says RTD. The interior of RTD’s new autonomous vehicle. The little, futuristic-looking bus will carry up to 12 passengers at a time along RTD’s newest route, the 61AV. It will originate at the Peña Boulevard transit station, go to a Park-n-Ride facility and hit several stops within the sparse Panasonic “smart city” campus near DIA. Rides will be free during the four- to six-month trial period. The bus does not have a steering wheel or traditional brake pedals, but RTD says the technology is safe, even during this test period. To prevent potential collisions, a human “safety ambassador” will always be aboard the vehicle as it navigates city streets on its own. RTD hopes that shared autonomous vehicles like this could one day help it solve the “first/last mile problem,” where potential transit riders choose to drive instead because bus and rail stops are not within walking distance from the places where they start or end their trips. In Denver, 73 percent of all trips happen in a car carrying just one person. 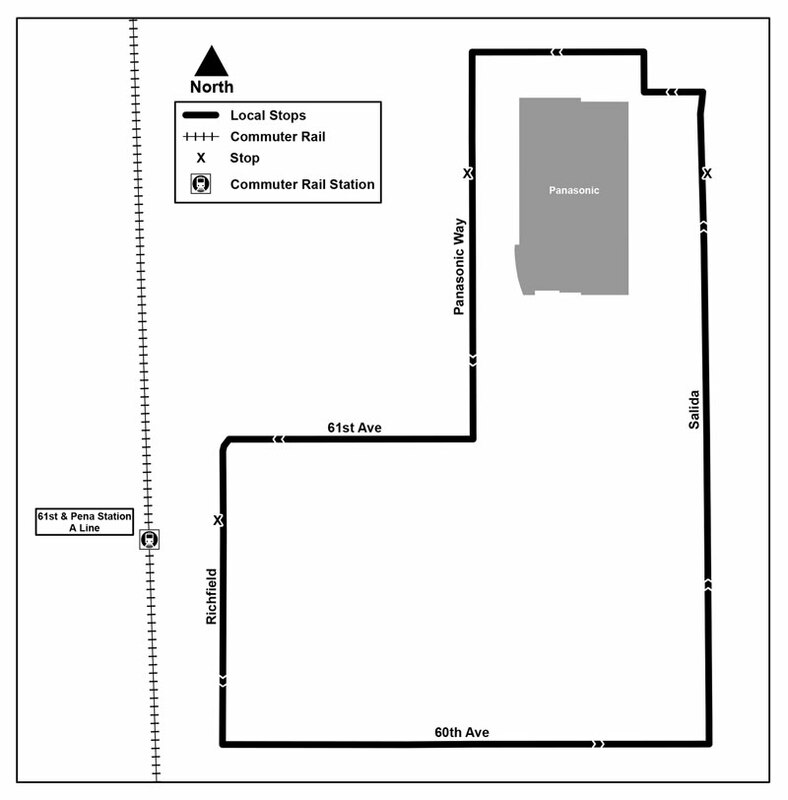 RTD’s route map for the 61AV. In this case, the shuttle connects rail and bus service to what the Japanese electronics company Panasonic calls Peña Station NEXT, a 400-acre site where the company tests how new technologies can improve cities. Today there is just one building there, but the company plans to build a larger neighborhood that will include 250 units of housing. RTD partnered with several public and private organizations for the project. 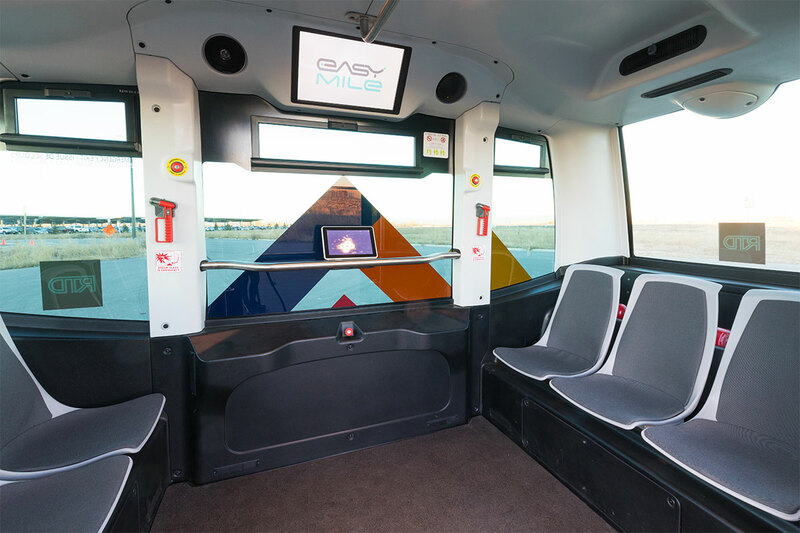 The French company EasyMile makes the vehicle; Transdev, a bus company, will operate the service. The schedule for the 61AV route is available on RTD’s website. RTD’s graphic treatment references the Rocky Mountains. If there is no operator, why is there a windshield wiper? Is it accessible to those with disabilities? If it won’t be free after the trial period (somewhat implied), how will fares be collected? It’s an interesting concept, and definitely worth “testing”, but the real test will be how well it handles snow, dust, hail and lightning. Can’t answer any of the other questions, but the driverless shuttle will be accessible to those with wheelchairs. There is an automatic wheelchair ramp attached to the shuttle according to EasyMile’s website. There’s a camera and or sensor in that location. Dirt, snow or rain could inhibit it’s function. Benefits of autonomous cars are overblown, but I’ll hang my hat on autonomous buses in dedicated lanes. Let’s get the lanes first. Fully fund Colfax BRT, then move on to Colorado Blvd next. Colfax Corridor BRT has a target to break ground in 2021, pending winning FTA funding. Next corridor will be Federal Blvd; a study for this has been initiated this year. Colorado Blvd needs to be light rail running from the I-25 Station up to the 40th Ave and Colorado Station for the A Line. I have heard many say that autonomous public transit vehicles, on fixed routes for example, perhaps in dedicated lanes on the busiest routes, are the future of public transit. They could radically reduce transit operating costs. Unfortunately that means that many transit operators will be out of a job. This is one great answer although it would seem to work better for suburban office parks. I’m a yuge proponent of first & last mile answers that include shuttle buses. To date only Lone Tree has had good success and their three new light rail stations aren’t even open yet – but will be in a few months. They picked the most uncomfortable chairs they could find to introduce the public to a new technology. Talk about facepalm.